The gleaming, white-columned building on the square sports a small brass sign identifying it as the home of the Transylvania Club. Could Sandersville be harboring a clan of vampires right next door to the Chamber of Commerce building? If so, it’s the most altruistic group of vampires in middle Georgia. In fact, the Transylvania Club was founded in 1908 for 25 young, unmarried ladies who were seeking intellectual improvement. The word transylvania actually means “through the woods,” says Mary Alice Jordan, a member since 1948. The story is that the boyfriend of one of the original members suggested the name since the ladies would be emerging through the woods of ignorance. The name, having nothing to do with vampires, stuck. At its second meeting, the group adopted as a project the creation of a public library for Sandersville. The first one opened in 1909 in the Masonic building downtown. When the structure burned in 1921, destroying the library’s 7,000 holdings, the library moved first into the home of one of the members, then to the hospital building and rebuilt its collection. In 1925, the women bought the antebellum columned building on the square to house the public library. For nearly 90 years, until 1998, the Transylvania Club provided library service for Sandersville. Since 1933, funds for the library have been raised through the sale of plates depicting the history of Georgia. Club member Annie Louise Irvin designed a set of 12 plates to celebrate the club’s 25th anniversary and the state’s bicentennial. The borders are an arrangement of cotton, peaches, Cherokee roses and long-leaf pine needles, broken by the state seal and depictions of other events from Georgia history. The centers feature James Oglethorpe, Wesleyan College, the capitol building in Atlanta and other Georgia sites and events. The plates have been produced in England by Wedgwood since their inception. In 1974 the Georgia General Assembly declared the set to be the official historical plates of Georgia. The plates are used in the Georgia Governor’s Mansion and have been presented to the Queen of England; they are sold all over the world. The money from the sale of the plates is still used to support the library. 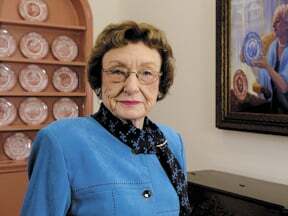 When a county library, the Rosa M. Tarbutton Memorial Library, opened in Sandersville in 1998, the library run by the Transylvania Club closed. The building on the square is now used as the club’s office for the storage, sale and distribution of plates. The Washington County Chamber of Commerce rents a portion of the building for its offices. The ladies of the Transylvania Club, now numbering 36, have stayed true to their original mission of supporting a public library. Rosa Tarbutton, for whom the new library was named, was a longtime club member. In addition, the club pays the salary of a children’s librarian and continues to donate funds and books for the enjoyment and enlightenment of Washington County.